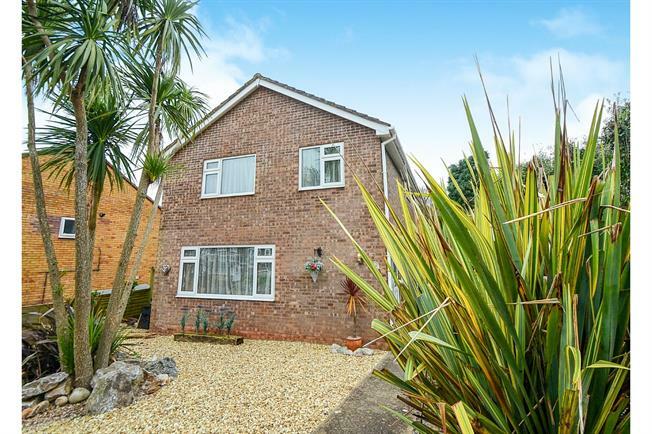 3 Bedroom Detached House For Sale in Paignton for Offers in excess of £300,000. Offered for sale with no onward chain is this spacious detached family home benefiting from a garage and driveway. The property comprises of welcoming entrance hall, downstairs WC, kitchen, living room with feature fireplace and dining room with patio doors leading to the rear garden. To the first floor you will find four bedrooms and a family bathroom. Positioned on a corner plot the garden wraps around the property and enjoys a level rear garden. Double glazed door into welcoming entrance hall with under stairs storage and double glazed window to the side aspect. Radiator. Spacious living room with feature fire place with gas fire. Double glazed window with front aspect and radiator. Double wooden doors leading into the dining room. Dining room with door leading to kitchen and double glazed patio doors leading to the rear garden. Radiator. A bright kitchen with a range of wall and base units with roll top work surfaces. Space for a cooker and fridge freezer. Space and plumbing for a washing machine and dish washer and cupboard housing the boiler. Doors leading to either the hall or dining room. Double glazed window to the side aspect and double glazed door leading to the rear garden. Low level WC and wash hand basin. Obscure double glazed window to the side aspect and radiator. Double glazed window with side aspect. Loft access and an airing cupboard. Spacious double bedroom with double glazed window to the front aspect and radiator. Double bedrooms with double glazed window to the rear aspect and radiator. Double glazed window to the rear aspect and radiator. Over stair storage cupboard/ wardrobe. Tiled bathroom, bath with shower over. Wash hand basin and low level WC. Obscure double glazed window with side aspect. Level gravelled front garden with palm trees. Path leading to the front door and to the rear garden. Enclosed rear level garden with a patio area ideal for al fresco dining, a variety of plants and shrubs and a lawn area. There is also a wooden door with accesses to the garage and side access to the front of the property. Garage located at the rear of the property with driveway in front for one vehicle.